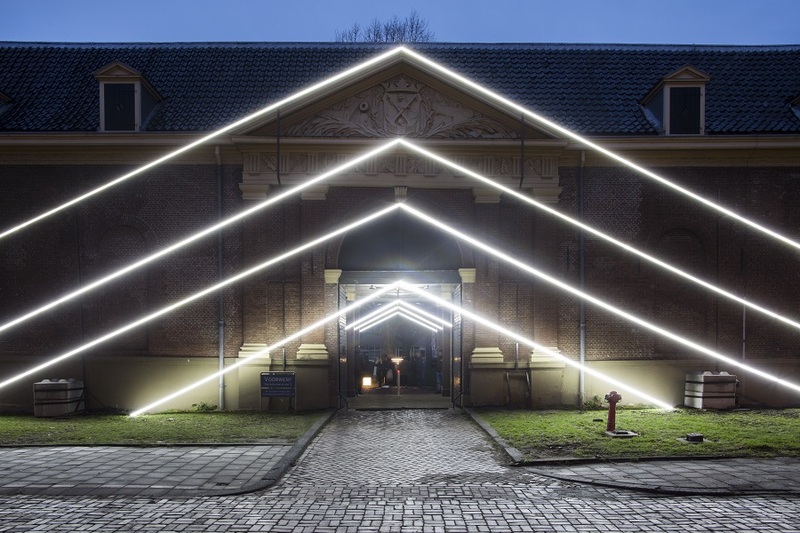 The enormous lines that make up Peter Vink’s installation Kattenburgerstraat 5 refer to the special tympanum that you will find above the 17th century entrance gate of the Marineterrein. The tympanum includes a relief of the arms of the navy’s forerunner, the Amsterdam Admiralty, as well as several depictions of shipbuilding tools that were used by the workers who entered the shipyard through this gate. 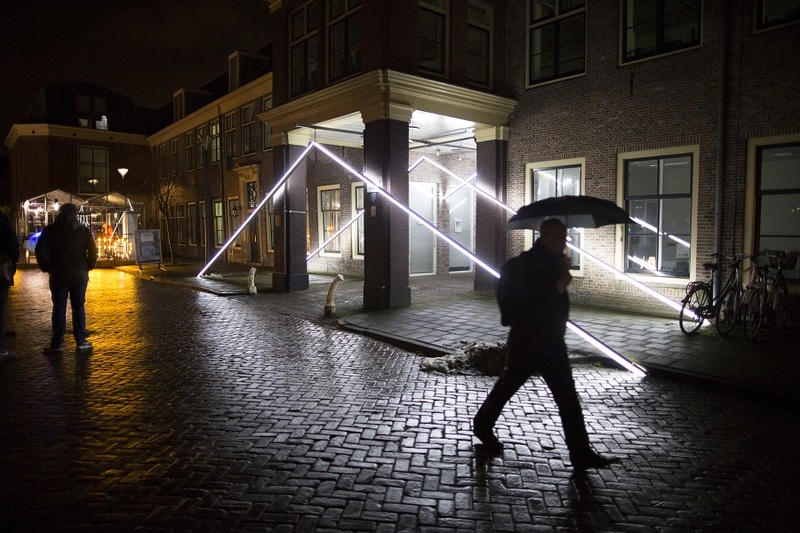 With his installation, Vink therefore not only pays attention to the shape and dimensions of the gate as it was designed by city architect Daniel Stalpaert (1615-1676), but also to its original function and the history that it symbolizes. Vink's tympanums accentuate the entrance of the gate, including the underpass itself. As you walk under the gate, it is as though the whole space bends towards you - just like time, space and light in our universe do. Einstein described it in his famous theory of relativity: when space and time are curved by the gravity of, for example, a black hole or planet, the massless light bends with it. 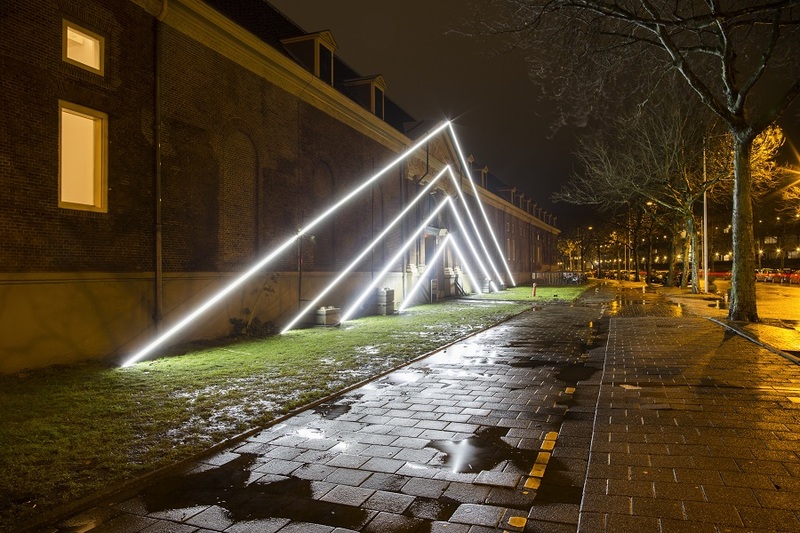 And so, Vink's light marking transform an age-old, everyday walk into a place that might be much more than that. Peter Vink’s (1974) work is always related to the specific location where it is placed, varying from buildings to landscapes. For example, his graduation project consisted of an installation of PVC tubes in the basement corridors of the Gerrit Rietveld Academy. His large-scale, minimalistic installations, built from geometric forms, have an architectural character. Vink uses the characteristics (lines, shapes, historical significance) of the surrounding space and makes them part of his work by enlarging, repeating or imitating them. This way, he lets us consciously view and experience the environment that we normally take for granted.